Chlorosis caused by iron deficiency is commonly associated with high bicarbonate levels in the soil. However, in rare cases such chlorosis has been observed in soils with high nitrate levels. In a dutch rich-fen, chlorosis has been noted in stands of Juncus acutiflorus at locations where groundwater containing high levels of nitrate reached the surface. Experiments revealed that the chlorosis could be attributed to iron deficiency although iron levels in the shoots were well above the known physiological threshold values for iron deficiency. It is postulated that increased nitrate assimilation leads to an increased apoplastic pH and to a concomitant immobilisation of iron and/or lower iron (III) reduction. Moreover free amino acid levels were markedly higher in the iron deficient plants in the field. It was found, however, that the percentage of nitrogen present as free amino acids was not influenced directly by low iron levels but mainly by the C/N ratios in the shoots. Nowadays, nitrate concentrations in ground water as high 1000 µM are no longer an exception in the Netherlands. 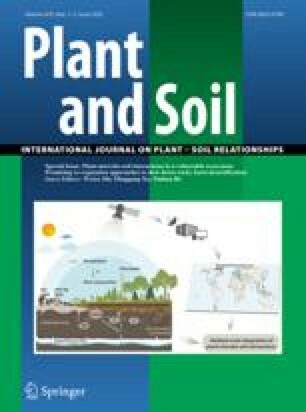 We propose that strongly increased nitrate inputs may cause iron stress in natural vegetations, especially in wet habitats.